Tony Hawk was one of the first professional skateboarders to earn mainstream recognition and he is still is still one of the biggest names in the sport. Understandably, items that include his name and likeness remain popular and that extends further than many high profile athletes because of his line of skating gear and video games. Among the many collectibles, Tony Hawk autographs are some of the most in-demand items, as well as his skateboards. 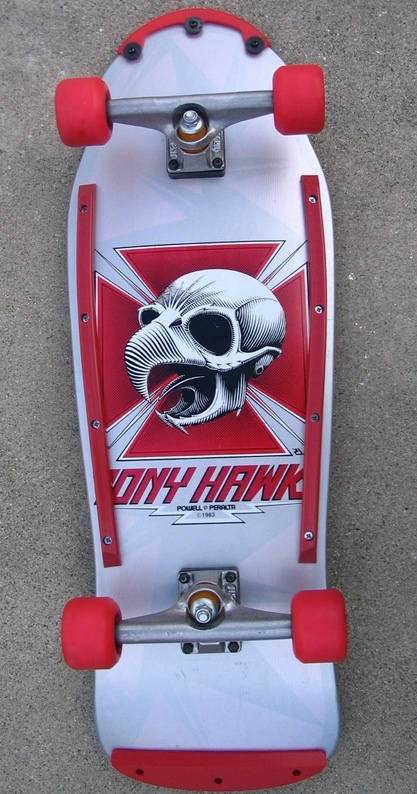 Shop for Tony Hawk cards on eBay. Tony Hawk turned pro in 1982 at the age of 14. From there, he went on an impressive run where he won most of the competitions where he competed, and was crowned the world champion in 12 straight years. Although he retired after the 1999 X Games, Hawk put his final mark on the sport as the first skater to successfully land a "900." The "900" is a skating trick that involves a two-and-a-half mid-air revolution. Although 1999 was the year his professional skating career ended, it was also the beginning of the Tony Hawk video game franchise. The popularity of the video games, Tony Hawk brand clothing and skateboards, and other endeavors have helped expose him to a new generation of skaters. Tony Hawk does not have a lot of cards for collectors to chase, but a few options are out there. 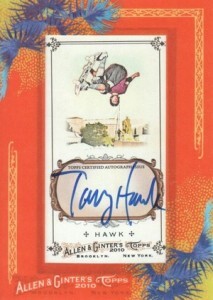 More recently, Tony Hawk autographed cards were included in 2013 Upper Deck Goodwin Champions. Skating cards have not proven to be as popular as more traditional sports, but Tony Hawk commands enough respect to make his the cards a solid collectible. Like another prominent athlete, Tony Hawk's first card came in the Sports Illustrated for Kids magazine. Although it was aimed at children, which explains the design, these cards have proven to carry good value. Be aware that there is a 15th anniversary version that looks similar. Below you will find examples of what an authentic Tony Hawk autograph looks like. This can be used as a first point of reference for determining the legitimacy of autograph memorabilia, but is not a substitute for having your items authenticated by a well-respected professional autograph authentication company. Some of the trusted sources within the sports memorabilia market include the following companies: PSA, JSA, Steiner, Tristar and Mounted Memories. The signature begins with a large "T"
The "o-n-y" can appear jumbled, but is generally legible.